Our family likes to make carbs in batches. 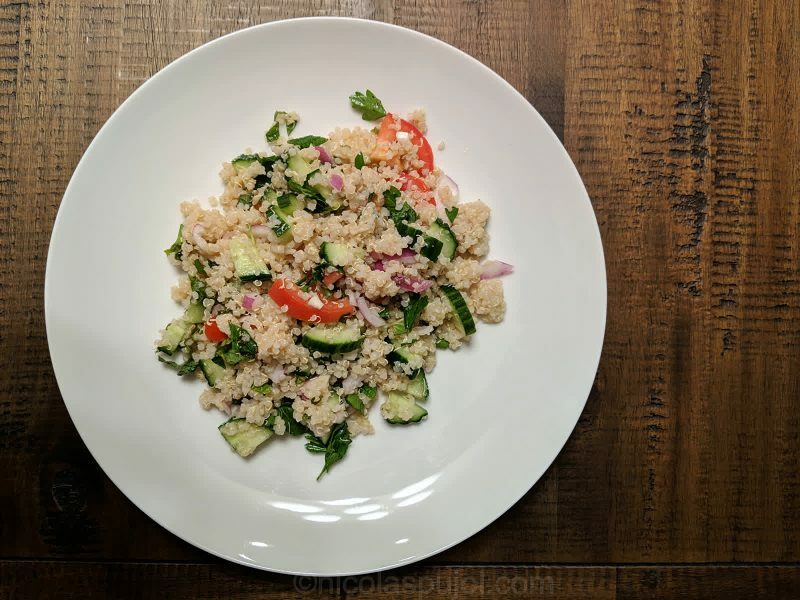 Last week we made some quinoa and used it for 3 or 4 meals. 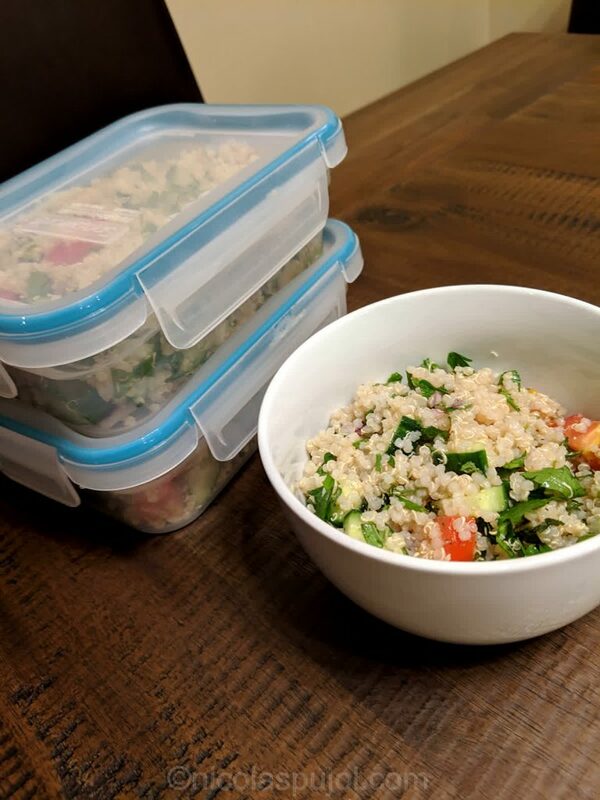 It saves time, and since quinoa can be refrigerated in a container for a few days, it allows you to not have to eat it sequentially at every meal. In other words, you can use it in one meal, then use other ingredients for another meal, then come back to it. For this final use, we had enough cooked quinoa for 6 people. This was the ideal ratio. 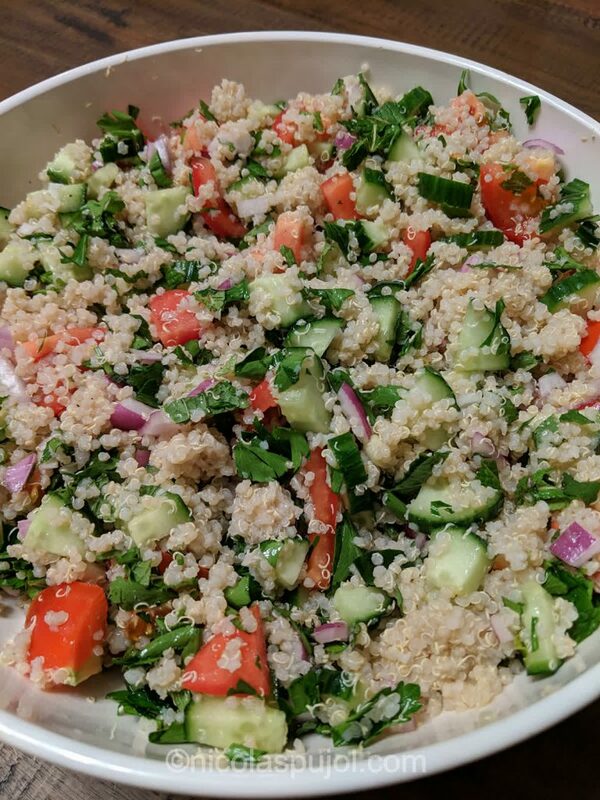 This no-oil quinoa tabouli (tabbouleh) salad makes for a refreshing main dish, using mint, parsley, tomatoes, onion, cucumber and lemon. 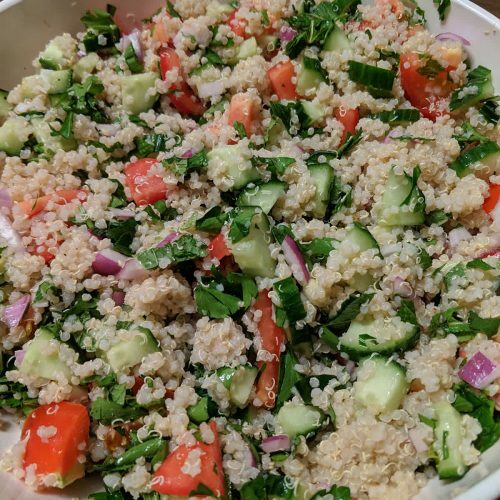 Last week, I made a similar version of this tabouli in a smaller batch and slightly different ratios, also choosing raw oats. Quinoa is becoming very popular, and it works in a similar fashion. 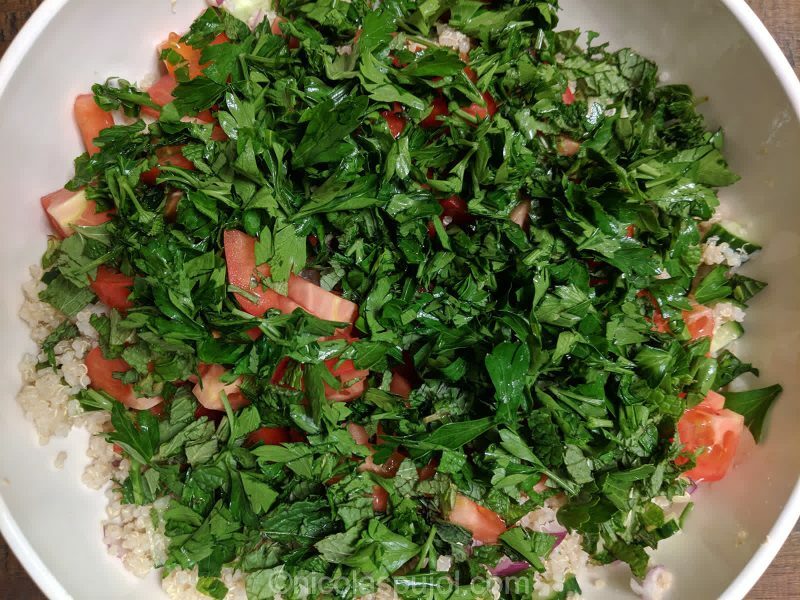 Two important tips to make a tabouli: the first is to chop everything relatively small. Chop the herbs finely, and do the same for the vegetables. 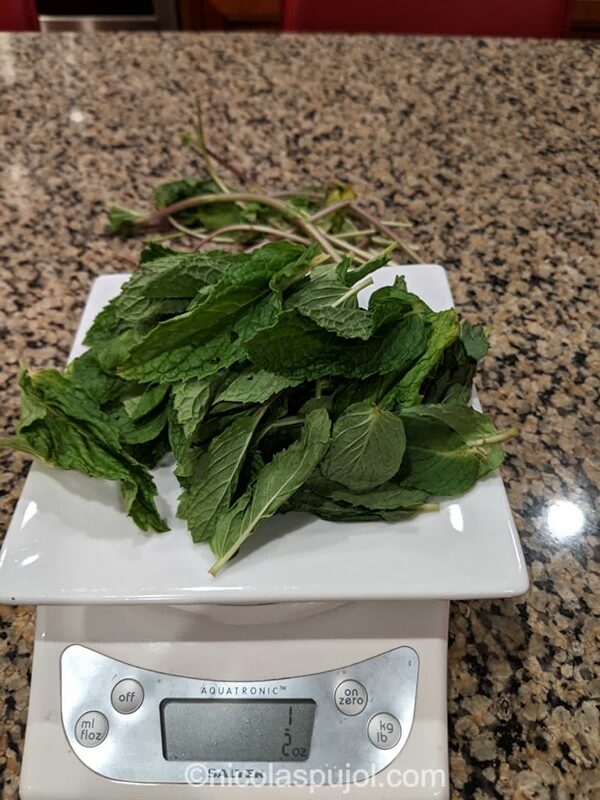 The other tip, when chopping mint and parsley, is to remove the stems prior to chopping. This puts more leaf and minimizes harder parts going into the salad. The juice from the lemons and tomatoes helped the final result achieve a balanced taste, not dry, and not liquid either. Quinoa grains are excellent at absorbing lemon juice and giving you back its flavor when you eat it. Enjoy, and see the final note after the recipe card on kids lunch ideas. 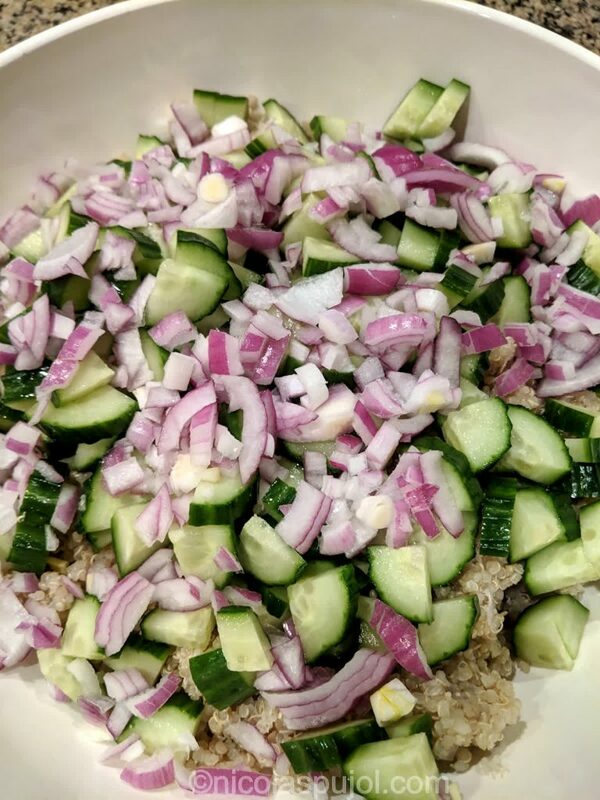 Cook the quinoa and place it in a large salad bowl. Let it cool if needed (best to prepare it in advance). Cut the cucumber, onion, and tomato in small pieces. Remove the stems from parsley and mint and chop very finely. Add vegetables and herbs to the quinoa, then add the lemon juice. Mix well then refrigerate at least 20 minutes for flavors to blend. Serve as is or add hot sauce. The proportions in this recipe made enough for about 6 full plates, which left some for kids lunch boxes plus a little extra for a next day snack, refrigerated and covered with plastic foil. Our youngest son, Marc, put some Tabasco hot sauce into his lunch box and made sure it would not be confused with his brother’s.